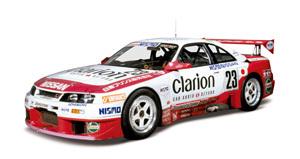 The R33 series was very similar to its predecessor, the R32 series. The GT-R was continued, as was the optional all-wheel-drive layout of the sedans and coupes. The car was still very sporty, although it had grown a little in size and weight and had thus become less agile. 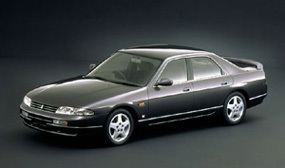 Succeeding the R32 line of sedan,s the R33 sedans feature rounder looks and a more spacious interior. Several inline-6 egines ranging from 2 to 2.5-liters are available, including the 2.5-liter RB25DET turbo with 245 hp. All engines come standard with rear-wheel-drive. GTS4 models come with all-wheel-drive and the non-turbo 2.5-liter RB25DE. The R33 Nissan Skyline GT-R replaces the legendary R32 Nissan Skyline GT-R, which it shares most its important technical bits with. The R33 GT-R is powered by the 280-hp 2.6-liter RB26DETT twin-turbo 6-cylinder engine and features a sophisticated electronically controlled all-wheel-drive. In comparison to its predecessor, the R33 grows in exterior and interior size and gains weight, but mostly preserves the good traits of the older model or improves on them. 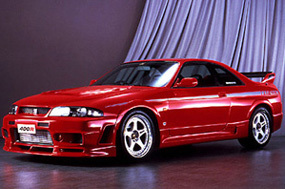 The Autech GT-R 4-door, a sedan version of the R33 Nissan SKyline GT-R, was released on January 16th, 1998 to celebrate the Skyline's 40th birthday. Just a few hundred examples were built by specialist vehicle manufacturer, Autech Japan, a Nissan affiliate company. Based on the two-door R33 Nissan Skyline GTR, the Autech GT-R 4-door comes powered by the 2.6-liter turbocharged inline-6 RB26DETT engine deploying its power through an electronically controlled all-wheel-drive system. Handling is complemented by all-round multi-link suspension and the highly sophisticated HICAS four-wheel steering system, which gives the car razor-sharp turn-in characteristics and excellent mid-bend stability. In February 1996, the so far most potent Skyline version saw the light of day in a very limited number of only 99 pieces. The NISMO 400R was intended as a road-going version of Nissan's GT-Skylines, to celebrate the race-track-success of the NISMO GT-R LM. In contrast to the latter, the NISMO 400R does not have rear-wheel-drive, but builds up on a very improved chassis of the most sporty and powerful R33 version, the R33 GTR V-Spec.